"This is not a book about selling. It does not give you some arbitrary selling formula guaranteed to increase your salespeople's sales. 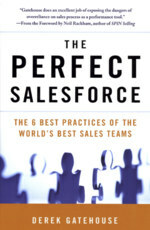 In fact, this book makes a compelling argument that you can't actually teach salespeople to sell much more than they currently do." Despite billions spent every year on personality profiling, sales training, motivational experts, coaches, and incentives, there's never been a proven formula for building a sales force of top performers. Derek Gatehouse argues that sales is about people, not process. The Perfect SalesForce is a return to people -- different types of people who excel very naturally in different types of sales jobs. It shows you how to find these people and manage them effectively. To identify what makes a top-producing salesperson -- the kind who sells four times more than average -- and to understand why some sales teams have a high percentage of top producers, Gatehouse interviewed more than two thousand executives in many different industries. He also tested virtually every personality assessment tool, sales process, training methodology, and management system available, only to conclude that the vast majority of those systems don't raise performance in a lasting way. Understanding how selling talents work is essential to building a sales force of top performers. This will let you cast the exact right talents for your specific sales needs. And that is the essence of The Perfect SalesForce.